Day one of the Sunfish Worlds and what a day it was! With 6-foot seas and winds blowing 15-18, the competitors who braved these conditions for the first 3 races of the championship sailed back to port exhausted and exhilarated. 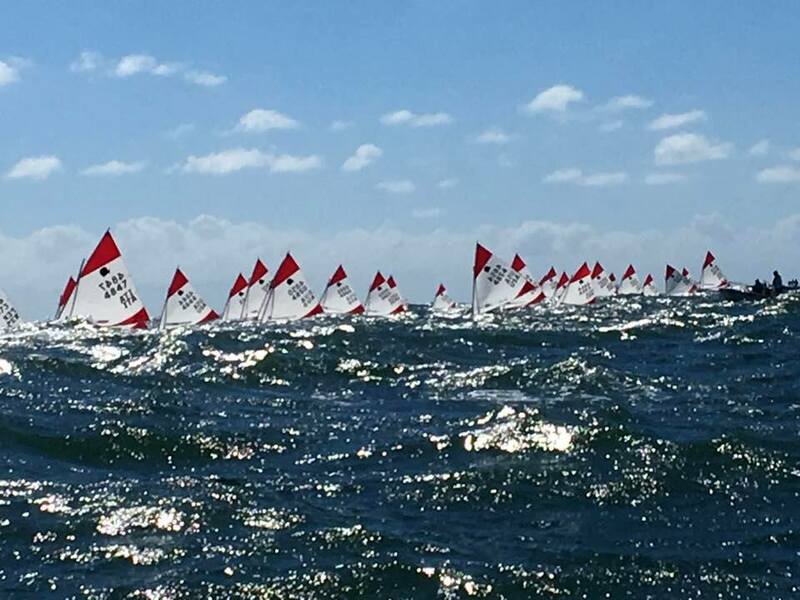 At the Carolina Yacht Club in Wrightsville Beach, NC, 76 competitors from 12 different countries are competing in this ISCA World Championship. A beautiful Opening Ceremony started out the activities at last night’s social event. Marching to their country’s song, representatives of these 12 countries carried their country’s flag while displaying big smiles and showing great pride in the country they represent. At the end of Day One, Jean Paul Trazegnies of Peru is in the lead after scoring two bullets and a 2nd, followed by Alonso Collantes, Peru, who is last year’s World Champion. Tied for 3rd and 4th place respectively is Martin Alsogaray of Argentina and David Hernandez of Guatemala. And in 5th place is the USA’s top finisher on Day One, Conner Blouin.